Thank you so much MS! I've been doing my best by keeping up with the dates, and often got the wrong dates because they would constantly change sometimes! So, I can't tell you how much this is appreciated! Update the Ult. Collection Vol. 2 to January and add a Vol.1 reprint to the TBD list. Good news, the Ultimate Collection is sold out at distributor level, and we'll most likely be doing another printing. This bodes well for the future of these books. Signs point to us doing Ultimate Collections for all the Eastman and Laird Mirage Vol. 1 issues, including- notably- City at War, most likely broken up into two volumes. More news as it is solidified. Print dates? As in when the the issues originally went to the printers? If so then that would be a question best posited to Bobby. Don Micro should hopefully come out 2/29/12. Leo comes out mid April, if all goes to plan. Awesome! Thanks for letting us know. Keep the info coming! I really hope IDW start publishing the microseries and other related issues the same week the regular ongoing issue is out. Not me, I'd rather them spread it out. Like for Green Lantern, nowadays it's pretty neat to have Red Lanterns come out one week, Green Lantern the next week, Green Lantern Corps the week after that, and Green Lantern: New Guardians the week after that. I concur. It gets me out of the house more too and looking at other stuff as well. Does anyone know when IDW puts out their previews every month? I just want to know when to expect the Leo one-shot cover to be revealed. It's usually around the middle of the month. Anywhere from the 15th to the 20thish is when I usually expect them to be posted. 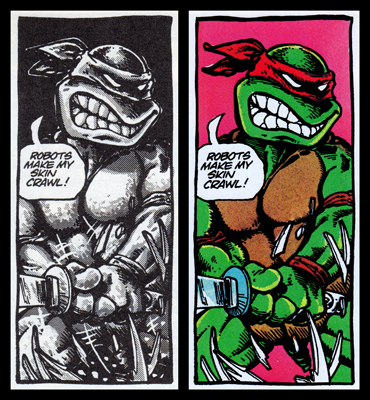 I have a question, I am new to really reading the TMNT comics, I grew up on the movies and TV show. Whith so many cover variations that come out with each release, how does one know what ones will be more valuable, and what ones to try and get? Also, what are all the collection releases that are coming out? The more "valuable" comics are going to be the retailer incentive variants, such as the RI-A,B,C,D covers for #1, and retailer exclusive variants, like the Jetpack Comics variants and VA Comic Con variants. Comics in general have been stuck in a buyers market for about 10 years now. There were rarer comics and variant covers that I got a great deal on 5 years ago buying them for $20 a pop that are now only worth $8. I wouldn't really get into it for the money, unless you can really shell out and pay for the really rare variants up front, such as the TMNT #1 RI D Eastman hand sketches (1:50 incentive) that are sure to go up in the future. A break down of the cover ratios might give you a better idea of what issues are harder to come by and thus have a better chance of being worth more in the future. For the first issue there are way more covers, I recommend checking out Rich's site to help you track them all down. For issue #1 I believe covers A,B,C,D that feature the turtles all had an equal pack in rate. Thanks for the feedback. My girlfriend bought me number 3 with the black and white turtles cover for christmas, it then inspired me to pick up the rest of the releases. I am not overly picky on the cover as long as I like it. I care more about having it than how much money I will make off it. The black and white cover for #3 is the 1:10 retailer incentive variant, so a nice cover you got there! Hope you enjoy the series and picking up the covers. Its been tough for me to track them all down but I've enjoyed it and the wide range the covers have. Now most of the issues will only have 3 covers to pick up, the A,B and 1:10 Retailer Incentive cover, so it should be easier from here on out! Glad I could help! Yeah, it comes out the 25th.